Is it mandatory to register my details to use Lycamobile services? While it is not mandatory to register your details, we would strongly recommend you do. Registering your number opens up many additional facilities including the ability to manage your Lycamobile account online, setting up of Auto top up, collecting itemized bill copies, changing or updating personal information and more. Why have I been charged for internet access when I use WiFi? Please note that some handsets switch from WiFi to Mobile Internet depending on signal strength. To avoid these issues, please deactivate the data option on your mobile phone while using WiFi. How can I register my Lycamobile SIM card? You can register your SIM card on our website www.lycamobile.co.uk. Please remember to have your PUK number handy. Will a bundle purchase be considered a top-up? No, a bundle purchase will not be considered as a top-up. I have topped up before registration; will I be able to get the £2 free credit? No, you must register before you top up to be eligible for the £2 FREE credit. 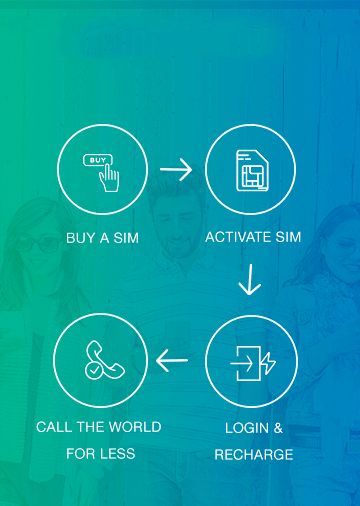 How do I get my £2 free credit for registering my SIM? Once you register your SIM, you need to successfully top up twice. After completing the second top up, you will get a welcome letter from Lycamobile within 7 business days which will contain the PIN number entitling you to £2 FREE credit. 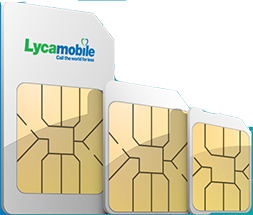 Do you provide a Lycamobile SIM with a handset? No, we only provide a FREE SIM card at the moment. Do you provide locked or unlocked handsets? No, all our handsets are unlocked. No. At the moment, we only offer Pay As You Go services, however, we do have various offers. See some of our unbeatably low-cost bundles here. I have credit but I am getting an error when attempting to make a call saying I do not have sufficient credit. Why is this? Your Lycamobile SIM is set up to let you know when your balance gets below a set level. That is why you may receive this error message. However, once you disconnect the first attempt and try again, the call will go through – as long as there is enough credit. If the problem persists, please call Customer Services on 322 from any Lycamobile number. I have enough balance on my Lycamobile SIM. Why am I still unable to activate a bundle? This could possibly be due to an active data connection. Please turn off mobile data and restart your handset. If the problem continues, please contact Customer Services on 322 from your Lycamobile. To get your itemized billing copy sent to you, please make sure you have a main balance/credit of £7.50 on your Lycamobile SIM card. We will send your itemized bill for the last 6 months, including the current month, to your registered address only. Please note that you need to be a registered customer to get the itemized bill copy. How can I check my billing details? To check your billing info and to manage your Lycamobile account, please register your SIM online at www.lycamobile.co.uk. Once you have completed the set up, you will get a case sensitive password which will allow you to gain access to online account management on our website. You can always check your balance by dialling *131# from your handset. Alternatively, you can call our Automated Voice Response on 321 from your Lycamobile phone. How do I check the call rates? You can check our unbeatably low rates from our website here. Alternatively, you can dial *136* followed by the phone number you wish to call with its country code and then # from your mobile. E.g. *136*0040377881276# (number is Lycamobile Customer Services). Firstly, please make sure you have enough credit to send a text. If you still can’t send or receive texts, please check the Message Centre Number (MCN) in your SMS settings – it should be +447404000111 for Lycamobile UK. If you see a different number, enter +447404000111, turn your handset off and on and then retry sending any unsent texts. If the problem remains please contact Customer Services. How do I activate roaming using Lycamobile? Roaming services are automated and they should work as soon as you travel abroad. If it seems roaming isn’t working, please restart your phone and you should be able to use our roaming services without any problem. How much does it cost to access my voicemail? Your Lycamobile voicemail service has been automatically activated. To access your voicemail from your Lycamobile in the UK dial 121 (or 91#). Calls to access the voicemail are absolutely free. We automatically deactivate SIM cards if you do not use them to make a call or send a text for more than 90 days. Unfortunately, these SIM cards cannot be reconnected and the mobile number also stops being available for you to use after this time. Can I send or receive premium texts or make premium rate calls using Lycamobile? No. Unfortunately, we do not offer premium texts or premium calling as part of our product offering. What mobile handsets can I use with Lycamobile? Your handset needs to be compatible with internationally recognised GSM standards, adopted by all the major handset manufacturers. There are no other restrictions on the type of handset you can use with Lycamobile. Please call our Customer Services team on 020 7132 0322 if you are unsure about your handset. How do I send a text message from the UK to another country with Lycamobile? Lycamobile works in the same way as other mobiles when it comes to sending international text messages. Simply text 00 followed by the country code without the first 0, then the area code and then the phone number and press send. Instead of 00 you can also use a “+”. For example, if you are texting someone in Romania, simply text 0040377 881276 (number is Lycamobile Customer Services and is not available to text). When it comes to making international calls, Lycamobile works in the same way as other mobiles or landlines. Simply dial 00 followed by the country code you are calling (e.g. 40 for Romania), then the area code without the first 0 (except Italian landlines where the first 0 is kept) and then the phone number and press the call button. Instead of 00 you can also use a “+” (e.g. +40). For example, if you were calling Romania from the UK, you would dial 0040377 881276 (example is Lycamobile Customer Services). Please note that most premium voice and text services in other countries cannot be reached from a mobile phone service when calling from outside that country. The flashing envelope indicates your text memory is full. This will usually prevent you from receiving more text messages until you have deleted a few old ones. You can delete messages from the Inbox, Sent or Draft folders to free up some storage space. The number of messages you can store will vary from one handset to another. When you receive a text from a company you have not given your number to, this is called SPAM. Unfortunately, Lycamobile is unable to prevent you from receiving these unwanted messages, unless you want to ban all text messages. These companies have clever ways of getting mobile phone numbers. One way to avoid SPAM is to be careful about what sites you give your mobile number to. How do I contact someone if I have a problem? Visit our Contact Us page for our rates and full details of the various ways you can get in touch with us. No, there are no monthly or hidden charges. Every price you see is what you’ll pay. Once you’ ve inserted your new Lycamobile SIM, you can view your number by dialling *132# (or 97#). My Lycamobile is a way of monitoring your calls and texts online. Join today to gain access to lots of useful tools, plus get £2 of FREE credit too. Find out more about My Lycamobile here. What should I do if I forget my PIN/PUK codes? If you activate your SIM PIN code and then enter the wrong PIN code into your Lycamobile three times, your SIM card will automatically lock. If this happens, you must enter your PUK code. Your PUK code is displayed on the SIM card holder that came in your starter pack. Please keep it for safe keeping. If you have already joined My Lycamobile, you can also find your PUK code displayed there – click here to login. If not, please call Customer Services on 020 713 20322 and our friendly team will return your call. How can I deactivate my voicemail service? To deactivate your Lycamobile voicemail service, simply dial *185#. Where can I buy a Lycamobile SIM or top up my balance? You can order a Lycamobile SIM for free here. Top-up vouchers can be purchased from at various locations as well as on our website. To find your nearest location, click here. What should I do if my handset is locked? If your SIM does not work when you first place it into your handset, it may have a SIM lock. If you have been with your current provider for more than 1 year, this lock can be removed for free. Please contact your current provider directly to request the code which will allow you to remove your SIM lock. Additionally, if your mobile phone screen shows any of the following when you first put your Lycamobile SIM into your phone: ‘blocked’, ‘barred’, ‘incorrect SIM’ or ‘SP lock’, your mobile may be locked to another network. There are a number of ways to unlock your phone – just call our friendly Customer Services team on 020 7132 0322 for expert advice. How long can I keep my number for if I don't use any of Lycamobile's services? Normally, we will keep your number for 120 days if you do not use our service. However, you may also keep your Lycamobile number for up to 1 year without using our service. Just dial *139*9999# from your Lycamobile and follow the instructions on the screen. Please be aware that there will be a fixed annual fee of £5 which will be deducted from your balance. What are ‘MBOS’ entries on my top-up history? Entries labelled as ‘MBOS’ on your top-up history show the rewards you are getting for using your Lycamobile. These are added automatically, are free and don’t have any cost to you. An Itemised Bill must be requested over the phone. Customers requesting an Itemised Bill should have a minimum main balance of £7.50 (for 6 months of billing) or £15 (for 1 year of billing). This is so we can automatically deduct the amount once we receive the request. We will then send the Itemised Bill within 7-10 working days. How can I get a detailed statement of my transactions? If you register for My Lycamobile, you will be able to view and download your billing history from the last six months free of charge. Why can’t I send pictures by SMS? Unfortunately, this feature is not available on Lycamobile. However, you can send pictures using Lycachat, our free-to-download communication app. I have been using the same bundle for a long time. Why has it now changed? To ensure that we offer the most competitive bundles to our customers, we update our rates as often as possible. For the most up to date information on our rates and bundles, please visit our website or call Customer Services on 322 from your Lycamobile. As an MVNO, our rates are subject to market conditions and rate fluctuations and we are constantly updating our products to ensure that we offer the best value for money to our customers. My bundle has been renewed by debiting the cost from my bank account. Why is this? When activating a bundle, there is the option for it to be automatically renewed. Please uncheck the box to disable Auto-renew. Please note that the Auto-renewal option is available for your benefit as it saves you the trouble of remembering to top up your account. However, you do also have the option to cancel Auto-renewal by dialling *190# at least 24 hours before the bundle expiry date. Where can I find the details of the bundle? To ensure that we offer the most competitive bundles to our customers, we update our rates as often as possible; for the most up to date information on our rates and bundles, please visit our website. Alternatively, you can also call Customer Services on 322 from your Lycamobile. I’ve activated the wrong bundle, what do I do? We do not have the option to cancel any bundle once activated; however, depending on the bundle and your usage of it, we will try our best to assist you. For more details, please contact Customer Services on 322 from your Lycamobile. Can I use these minutes to call other countries? Each bundle is specifically designed to cater to specific customers. You will only be able to call the countries specified in the bundle you have activated. I have activated a bundle and have used all the allowance. Can I activate the same bundle again? At the moment, you will only be able to activate the same bundle once a month. Can minutes be carried forward to the next month if they’re not used? No. As per the terms and conditions, all allowances will expire on the same day as the bundle expiry date. Does a bundle have an expiry date? Yes, the expiry details are mentioned on the bundle page and can be found in the terms and conditions. Will I be able to activate the bundle with my promotional balance? No, you need to have available credit on your main balance to activate any bundle. How do I check if a bundle is active on my Lycamobile? Please remember that you can always dial *137# to check your balance and allowance details on your Lycamobile account. How do I activate a national bundle on my Lycamobile? Please visit our UK Plans page where you will find the specific activation code for the bundle that you are interested in. Alternatively, you can always call Customer Services on 322 from your Lycamobile. How can I cancel Auto-renewal on my bundle? You can cancel Auto-renewal by dialling *190# and entering 1 to confirm the cancelation. This option is also available online. Log in to your My Lycamobile account and go to Overview > Click Here to View Bundle Details > View Details > Cancel Renewal. How can I add more data to my bundle? When you use all your data allowance before the expiry date you can continue using data but will be charged at our Standard National Pay As You Go rates. To add more data to your existing bundle, simply purchase a Data Bolt On. This will be valid until your bundle expires. I have received the message ‘Dear Subscriber, you are restricted to purchase this bundle.’ What does this mean? Most bundles can only be activated once every 30 days. You can either wait until your bundle expires (dial *137# to see its expiry date), add more data with a Data Bolt On or activate a different bundle. What is the Loyalty bundle? Free minutes to call other Lycamobile numbers and other perks will appear on your Loyalty bundle. This is a free reward added automatically to your account and doesn’t have any cost to you. Will my plan work in the EU? Plans and bundles are only valid within the UK unless stated otherwise. Will my plan work abroad? I lost my SIM card and would like to claim insurance. What should I do? Please send an email to cs@lycamobile.co.uk with the required details such as IMEI number and Handset make/model, along with a copy of a utility bill to verify your identity. After verification has been completed, we will provide you with proof of usage which you can use for claiming your insurance. I have lost my SIM card and would like to block it to avoid someone using it. Is this possible? Please contact Customer Services on 322 (if calling from a Lycamobile number) or 0207 1320322 (if calling from any other number) with your SIM card details and your card will be blocked. Please contact Customer Services on 020 7132 0322 as quickly as possible and one of our advisors will help you. I’ve lost my SIM card and want all my contacts back. Is this possible? We don’t have the option to get your contacts back, however, if you are a registered customer you may login to your My Lycamobile account and check your dialled numbers. For more details, please contact Customer Services on 322 (if calling from a Lycamobile) or 0207 1320322 (if calling from any other number). After I report my SIM card as lost, will incoming calls be blocked? At the moment, we do not have the option to block incoming calls; however, your outgoing calls will be barred as soon as the number is blocked. I lost my SIM card and want the same number back. Is this possible? You can receive a new SIM card by ordering it online, or you can get a SIM card from any of our retail partners. Once you have the new SIM card, please call Customer Services on 322 (if calling from a Lycamobile) or 0207 1320322 (if calling from any other number) with your PUK number and we will help in transferring your old number to your new SIM within 24 business hours. I wish to port-out my number to another service provider. How do I do that? We are sorry that you have chosen to leave us and would like to know why. Please contact Customer Services on 322 where we would like to hear your feedback or concerns. If you would still like to leave us, we can issue you the PAC code and you will be able to move to a different network. I have an active bundle on my old number and my new number; if I make a SIM transfer, can I retain both the bundles? We will be able to transfer your bundle from the old SIM, however, the bundle in the new SIM will be deactivated after SIM transfer. How can I transfer the balance from my previous Lycamobile number to my current one? At the moment, we don’t have the option to transfer the balance from one account to another; however, you will be able to transfer the balance along with the mobile number and any active bundle as part of a SIM transfer. For more details, please contact Customer Services on 322 from your Lycamobile. Do I get any benefits if I transfer my number to Lycamobile? Yes, we offer some of the best rates to call internationally and are one of the few service providers to give unlimited 4G data. As the world’s largest international MVNO, we operate in 23 countries around the world and this means you can always be in touch with your family and friends without breaking the bank. How quickly will a port-in request be completed? Your port-in request will be completed in 2 business days, but this timeline also depends on the previous network provider and may be extended. Can I top up my Lycamobile SIM card before I complete the port-in procedure? Yes, you can top up your Lycamobile SIM card and the credit will be available even after the port-in is completed. A PAC code is a Port-in Authorization Code that is needed to complete a mobile number transfer from one provider to another. You need to contact your current network provider to get the PAC code that is alphanumeric. When I port-in from another network, can I transfer the credit that’s on my old SIM card? No, you will not be able to transfer the credit from a different network. How can I transfer my number from my current network to the Lycamobile network? You can receive a new FREE SIM card by ordering it online here or you can get a SIM card at any of our retail outlets. Please contact Customer Services on 322 (if calling from a Lycamobile number) or 0207 1320322 (if calling from any other number) with your new Lycamobile SIM and a PAC code from your previous network provider and we will port-in your number within 2 business days. You can also visit https://www.lycamobile.co.uk/en/help/transfer-your-number/ to place the port-in request online. Please note that you will have to collect your PAC code from your current service provider. Why I am not getting the port-in offer? The port-in offer is not applicable to those number that were originally from Lycamobile and were subsequently ported out to other companies. How can I transfer my number to Lycamobile? For all the information you need on how to transfer your number to Lycamobile, including being rewarded with up to £15 free credit, click here. My SIM has been damaged, lost or stolen. What should I do? Call Customer Services and they will arrange for a new SIM card to be sent out to you. Your number should be transferred to the new SIM within 24 business hours. I need a different sized SIM card for my phone. What should I do? My phone is asking for a PIN number while saving the settings. What is my PIN number? You can either enter “0000” or “1234”. Is a username and password mandatory? No, you can ignore that option. Can I get the settings in my email so I can do it myself? Yes, please call us on 322 with a valid email address and we will be able to send the settings to the requested email address. Do I have to manually input settings on my handset to access the internet? Depending on your handset model, the settings will vary. For most phones, you will automatically receive the settings, which you will have to save for it to work. You can manually choose the settings for your specific handset model by visiting our Mobile Web Settings page. Alternatively, you can contact our customer service on 0207 132 0322 from any network or 322 from your Lycamobile number. Will I be able to access data in 4G? Yes, depending on your handset and area, you will be able to access data. Will I be able to use the Internet on my Blackberry or dongle? No, at the moment, we do not support Internet on Blackberry or dongles. Will I be able to access the Internet while roaming? No, at the moment, we do not support data access when in roaming. Why am I unable to access the internet even though I have a data bundle active? Please ensure that mobile data and data roaming are on and also check the manual settings by visiting our website. Why do I get messages for GPRS settings? Every time you change your handset or reset your phone, you will get the automated settings messages, however, once you save or install the settings the messages will stop. Why can’t I share my data connection with other devices? Unfortunately, you cannot use your device as a modem to share your data connection with other devices. If you have a smartphone, download Lycachat for FREE today to send texts, make HD-quality phone and video calls and send photos and video messages over WiFi, 3G or 4G free of charge! Download it on android here or on iOS here. My internet has stopped working. What should I do? Please ensure that you have enough data allowance or sufficient balance available on your phone. You can always find out the exact leftover allowance on your Lycamobile account by dialling *137# and then pressing call. If the problem persists, please contact our friendly Customer Services team on 322 from any Lycamobile. My SIM doesn’t work in a specific handset but other SIM cards do. Why is that? Since your SIM isn’t working in your handset while other SIM cards are, it might be an issue with your handset provider; or the mobile phone could be locked, meaning it only accepts SIM cards from a particular service provider. Please contact the handset dealer for more assistance. My SIM seems to be damaged and I am not able to connect to the network. What should I do? If the SIM is damaged, please contact our customer service on 0207 132 0322 from any network or 322 from your Lycamobile number. We will provide you with a brand new activated Lycamobile SIM and PUK number and help you transfer your old number to your new SIM within 24 business hours. Why can’t I connect to the network after returning from a trip abroad? A. Find an option called Lycamobile Services or Lyca Services on your phone. This will likely be found somewhere in your settings folder, under ‘Tools’, ‘SIM’ or among the apps. B. 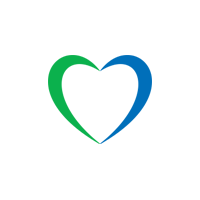 After finding Lycamobile Services, select Lycamobile > Mode > Manual > National. C. After selecting ‘National’, your phone will return to a previous page or start the Manual Network Search by itself. D. Following this, reset your phone without taking the SIM out and then start the Manual Network Search again. Once you have manually connected, restart your phone. What should I do when I see ‘No network/Emergency only’ on my phone? Once you have manually connected, restart your phone. If after several attempts the above procedure is not working, check the SIM card’s surface for scratches or cracks. If the SIM is damaged, go to your nearest retail point for further assistance. Why am I not getting complete coverage in a few places? The network coverage is heavily dependent on location and our network partners. Please keep trying and if the problem persists, contact Customer Services on 322 from your Lycamobile. Why does my phone show emergency calls only? Please restart your handset and select the network manually, you can choose Lycamobile or O2. How can I set up Lycamobile to automatically top up my account once my balance gets too low? After completing one successful top up with your credit or debit card, you have the option to activate Auto Top-up. You set this service to automatically top-up a predetermined value, each time the balance drops below a value set by you. You can also control the frequency and value of the top-up. I have changed billing address. How do I update it? You can now manage your entire Lycamobile account, including changing the registered address, online at www.lycamobile.co.uk. Alternatively, you can also change your address by emailing cs@lycamobile.co.uk with your full name, date of birth, Lycamobile number and a copy of your utility bill showing the new address. I am unable to top-up online and the page gives an error. What should I do? Our website is best enjoyed using Internet Explorer or Google Chrome. Please avoid using other web browsers like Firefox or Opera. If the problem still persists, please contact our customer service on 0207 132 0322 from any network or 322 from your Lycamobile number. I made a top-up using PayPal. Why hasn’t it come through on my account yet? While making an Online Top-up with a debit or credit card is instant, transactions using PayPal may take up to ten minutes to appear on your Lycamobile account. How can I pay online with a debit or credit card? You may be required to follow additional security procedures. For Visa cards, please refer to the ‘Verified by Visa’ procedure explained here. For Mastercards, please refer to the ‘Mastercard SecureCode’ procedure explained here. How do I top-up using a credit or a debit card? After your card has been registered, you can simply dial 321 and use our Interactive Voice Response to top-up over the phone using your credit or debit card. How do I transfer credit to my family in another country? *The number 1 at the end of the code represents the equivalent amount of GBP in your Lycamobile credit and this amount will be debited from your mobile credit. You can also complete an Airtime Transfer using My Lycamobile on our website. Is there a limit on how much I can transfer to someone using Airtime Transfer? There is no set limit for the Airtime Transfer. However, since this involves transferring calling credit across countries, certain international laws will be applicable. It will also depend on the usage patterns. Lycamobile reserves the right to block or restrict transactions. How much does Airtime Transfer cost me? This is a free service for all Lycamobile customers; however, the standard currency exchange rates would apply. Please visit our website to check the exact value of currency applicable for the country you are trying to transfer credit to. Lycamobile’s Airtime Transfer service allows you to securely transfer mobile credit from your Lycamobile account to any mobile number in over 50 countries. This means that you can transfer credit to your friends and family abroad, irrespective of whether they are with Lycamobile or not.